Book hotel rooms online with us at Ria Park Garden Hotel at the lowest rate, guaranteed. Get your holiday discount room rate at the 4 Star Ria Park Garden Hotel located between the two resorts, Quinta do Lago and Vale do Lobo in the central Algarve. 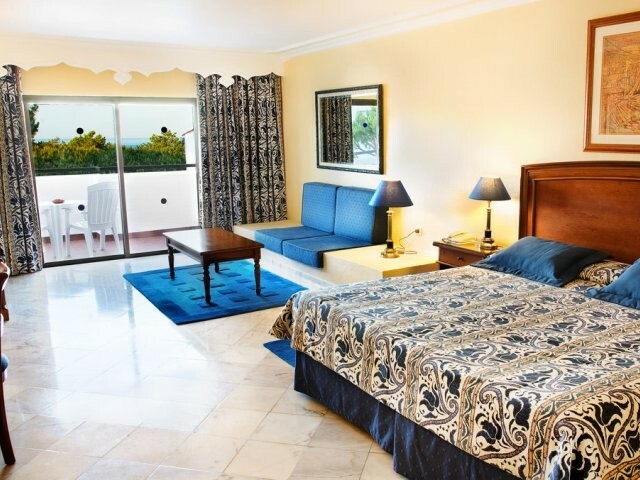 The hotel has 109 comfortable bedrooms providing holiday accommodation from two adults and one child to a Family Room for four adults and one child. The modern comfortable suites are air-conditioned have satellite TV, radio, direct dial phones, a mini-bar, a safe, luxurious bathrooms and internet access. Ria Park Garden Hotel facilities include the Spa with massages and beauty treatments, sauna and steam baths, a restaurant, snack-bar, two bars, an indoor pool, an outdoor pool, two tennis courts, an official sized football pitch, a well-equipped Fitness Centre, the Ria Kids Club and playground. The beach is just 800 metres walking distance from the hotel.